This magnificent guan jar was painted in the finest cobalt blue by an extremely skilled artist. It belongs to a small, closely linked, group of such jars which depict scenes from contemporary literature. Until recently only seven of these jars were known to have survived in international collections. The current, previously unrecorded, jar brings their number to eight. All these jars were made using high quality raw materials, including the finest cobalt, and have exceptionally skilfully painted decoration inspired by contemporary woodblock printed illustrations. Like the current jar, six of the previously known jars have a wave band around the neck. This wave band is painted in a very similar style to those on the 'David vases' in the Percival David Foundation, London (Fig. 1), which bear inscriptions dating them to AD 1351 (discussed by R. Scott in Imperial Taste - Chinese Ceramics from the Percival David Foundation, Chronicle Books, San Francisco, 1989, pp 54-5, no. 27). Three of the jars have lotus scrolls around the shoulder, one has a composite floral scroll, and three, including the current jar, have peony scrolls around the shoulder. The eighth jar, in the Boston Museum of Fine Arts (see Zhu Yuping in Yuan Dai Qing Hua Ci, Wenhui chubanshe, Shanghai, 2000, pp. 229, no. 8-57), has no shoulder band. The Boston jar also has no additional band around the foot, while six of the other jars have petal panels containing pendant ruyi heads and circles, however the petal panels around the foot of the current jar contains emblems. It is significant that these emblems are extremely close to those in the petal panels around the foot of the David vases. Interestingly, the peony scroll on the current jar also bears strong similarities to that around the foot of the David vases. The particular closeness of three of the decorative bands - wave, peony and emblem - on the current jar to similar decoration on the David vases strongly suggests a date near to AD 1351 for the jar. There are also a number of significant similarities between the current jar and the famous Yuan fish jar in the Museum of Oriental Ceramics, Osaka (illustrated by Tokyo National Museum in their catalogue of the Special Exhibition - Jixiang - Auspicious Motifs in Chinese Art, Tokyo, 1998, p. 70, no. 46). In regard to decoration, the petal panels around the base of both jars contain emblems, with flaming pearls appearing in each alternate panel. The wave band around the necks of the two jars are very similar, and the peony scrolls around the shoulders are not only similarly painted, they also share almost identical composition Examination of the potting characteristics and finishing of the two jars shows them to be so alike that they could have been thrown by the same potter. Although the main decorative bands have different themes, they were both executed by master painters. Jars of this form provided an ideal 'canvas' for the ceramic decorator. The main decorative band has therefore at times been used to depict narrative scenes from Yuan folk tales and zaju drama, which was a very popular art form in the Yuan period. The jar in the Idemitsu Museum, Tokyo (Fig. 2), depicts the story of the Chinese court lady, Wang Zhaojun, forced to marry the Xiongnu king Huhanxie Chanyu, which is told in the early 14th century drama Han Gong Qiu (literally, Autumn of the Han Palace, but usually known in English as The Sorrow of Han), by Ma Zhiyuan and the poem by Ouyang Xiu. On the jar Wang Zhaojun is shown being led away to her new home in the west, with her lute held tightly in her arms, and accompanied by hirsute barbarians. Another jar, now in the possession of the Pegasus Trust (Fig. 3), depicts scenes from San Gu Mao Lu (Three Visits to the Thatched Hut), which became one of the episodes in the San Guo Zhi Yan Yi (The Romance of the Three Kingdoms). In this episode three visits are made to Zhuge Liang in order to persuade him to support Liu Bei, the ruler of the kingdom of Shu, in his struggle against Cao Cao, ruler of the kingdom of Wei. A third jar, formerly in the Ataka Collection (Fig. 4) and exhibited at the Museum of Oriental Ceramics, Osaka, in 1997, is decorated with scenes from Xi Liu Ying by Zheng Guangzu depicting Zhou Yafu. Zhou Yafu was the son of Zhou Bo, who had been Prime Minister to Emperor Wen (r. 179-156 BC). Zhou Ya fu served Wen's successor, Emperor Jing (r. 156-41 BC), under whose rule the king of Wu started the rebellion of Seven Kingdoms. Loyal to the Emperor, as his father had been, Zhou Yafu put down the rebellion. As well as his loyalty, Zhou Yafu is also known for his cunning in refusing to enter into battle with the rebels until the latter were weakened by hunger. Another jar decorated with this theme was in the collection of Baron Ito in Japan, but was destroyed during the Second World War. This second jar, published by Kikutaro Saito in Kobijutsu 1967, no. 18, p. 39, fig. 16, is the only other known Yuan narrative jar to have emblems in petal panels around the foot of the vessel, similar to those on the current jar. It is also worth noting that although the Ito jar and the former Ataka jar share the same theme, and show a similarly decorated textile screen tied behind the seated figure, they depict different episodes from the story. The theme of the decoration on the fourth jar, in the Boston Museum of Fine Art, is the Yuan dynasty drama Yu Chi Gong Jiu Zhu (The Saviour Yuchi Gong) about the Tang dynasty general Yuchi Gong, who saved the Emperor Taizong from assassination. On the fifth jar, now in a private Asian collection (see Zhu Yuping in Yuan Dai Qing Hua Ci, Wenhui chubanshe, Shanghai, 2000, pp. 229, no. 8-58), is an episode from one of China's most famous romantic tales- Xi Xiang Ji (Romance of the Western Chamber) by Wang Shifu. The story tells of the love affair between the beautiful Cui Yingying and the poor scholar Zhang. In this scene the heroine, Cui Yingying offers incense in honour of her deceased father. The Xi Xiang Ji is also the theme of decoration on a meiping in the Victoria and Albert Museum (illustrated by Rose Kerr (ed. ), Chinese Art and Design - The T.T. Tsui Gallery of Chinese Art, Victoria and Albert Museum, London, 1991, p. 67). On this vase Madam Zheng, mother of the heroine, Cui Yingying has learnt of Yingying's love affair with the penniless scholar Zhang and is very angry. Having sent Zhang away to try and achieve success in the capital, she threatens to beat Yingying's maid, Hongniang, unless she divulges the whole truth about the affair. 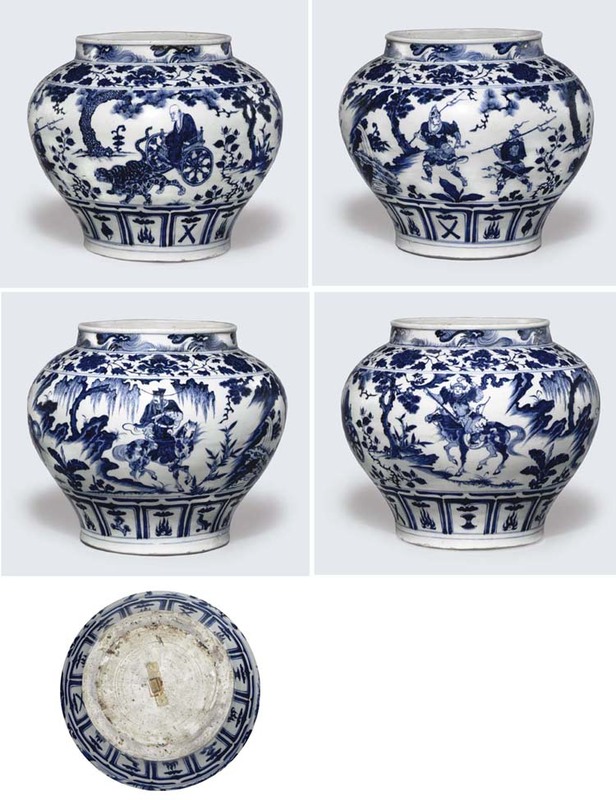 A sixth jar, formerly in the British Rail Pension Fund (Sotheby's, Hong Kong, 1989, lot 12), takes its main subject from the Yuan drama Meng Yue Mei Xie Hen Jin Xiang Ting (Meng Yuemei writes of her regrets in the Pavilion of Fragrant Brocades). The name Jinxiang Ting is inscribed over the pavilion doorway. This romance, which takes place in the reign of the Tang dynasty emperor Xuanzong, concerns the bittersweet love affair between Meng Yuemei and poor scholar Chen Gui. The pair having fallen in love and become betrothed, are separated by Yuemei's father, who sends scholar Chen to the capital to get his jinshi degree. Although he is successful, sadly both Chen and the Meng family fall foul of the rebel An Lushan, and it is only after many vicissitudes that the lovers are finally reunited. The scenes depicted on a jar formerly in the Manno Collection and previously in the collection of the Tokugawa Family (Manno Art Museum, Selected Masterpieces of the Manno Collection, Osaka, 1988, no. 102), have been identified as coming from the Bai Hua Ting (The Hundred Flowers Pavilion), another Yuan dynasty romantic drama. The hero, Wang Huan falls in love with a beautiful courtesan, He Lianlian, but he is poor. Lianlian's mistress therefore sells her to a rich merchant, Gao Miao. Lianlian takes refuge in a temple, where Wang Huan is able to meet her secretly by dressing up as an itinerant pear-seller. Lianlian then gives Wang Huang some of her jewellery to sell in order that he can join the army. Wang Huang makes a success of his army career, whereas Gao Miao is caught embezzling money from the government and is thrown into jail. Eventually He Lianlian and Wang Huang are reunited and able to marry. The scene on the current jar is particularly interesting, and does not seem to have been used to decorate any of the other extant jars or meiping. The story derives from the Zhanguoce (History of the Warring States) and concerns the conflict between the states of Yan and Qi. The invincible General Yue Yi was sent by the ruler of the state of Yan to conquer the state of Qi. The state of Qi employed the famous strategist (zonghengjia) Sunzi to counter Yue Yi's attack and to regain the land already lost to Yan. The historical events, embellished with folklore, are related in Xinkan Quanxiang Pinghua Yue Yi Tu Qi Qi Guo Chunqiu Houji (The New Woodblock Fully Illustrated Pinghua of Yue Yi Planning [the conquest] of Qi, Latter Part of the Spring and Autumn of the Seven States). Pinghua were a colloquial literary form, probably derived from the scripts of storytellers, and were a precursor of the Chinese novel. They were mainly based on historical events dramatised with myths and folk tales. The Yue Yi Tu Qi was printed in the Zhizhi reign (AD 1321-23) by the Yu Studio in Jian'an (modern day Jian'ou in Fujian province), and is one of at least five such works printed by this studio. The only surviving 1320s copy is preserved in the Naikaku Bunko in Japan. The woodblocks for the Yue Yi Tu Qi were cut by Wu Junfu, a native of Qiaochuan in Fujian. One of the woodblock printed illustrations (Fig. 5) is remarkably close in its composition to the scene on the current jar. It is significant not only for the current jar, but also for the other vessels with well painted narrative scenes that the Jianyang area in northern Fujian province, which was a centre of book publishing, was so geographically placed as to have good communications with Jingdezhen, thus facilitating the influence of woodblock printed illustrations on the porcelain artists. The scene on the jar is concerned with the part of the story in which Su Dai, an emissary from the state of Qi, goes to ask the help of Wang Yi, a famous strategist, in seeking to free Sunzi who had been captured by the Yan general Yue Yi during battle. Wang Yi's sobriquet was Guiguzi, because he came from Guigu, and although there is no historical evidence to suggest a relationship between them, the story describes Sunzi as Guiguzi's devoted disciple. On both the jar and the woodblock illustration Guiguzi is depicted seated in a cart being pulled by two felines. Preceding him are two armed attendants. On the woodblock illustration Su Dai in the dress of an official is shown on horseback rounding a rocky outcrop directly behind Guiguzi. Su Dai is also shown in the scene on the jar, but there is a second equestrian figure between him and Guiguzi. This second figure is in military dress and carries a banner on which the name Guigu (Phantom Valley) is inscribed - a reference to Guiguzi's home. It is probable that this military figure is Dugu Jiao, whose father Dugu Chen was a general with the Qi army and had been captured in the same battle as Sunzi. Dugu Jiao is described as a powerful young man who brought an army of some 3,000 soldiers to join the forces of Qi in order to free the captives. The Daoist Wang Hui lived in the time of the Wei dynasty. He was the disciple of the White Goat Master. He used tigers and leopards to plough for him, and also travelled back and forth on them. He put trappings and saddles on them and used whips, as if they were horses. The guan jars have stylistic associations with several well painted Yuan dynasty meiping. In addition to the vase in the Victoria and Albert Museum, mentioned above, another meiping in this group shows four of the Eight Daoist Immortals and is in the Museum of Fine Arts, Boston (illustrated by Sherman E. Lee & Wai-Kam Ho, Chinese Art under the Mongols: The Yuan Dynasty (1279-1368), Cleveland Museum of Art, 1968, no. 139). Another vase, also in Boston (illustrated by Sir Harry Garner in Oriental Blue and White, Faber and Faber, London, 1973 edition, pl. 19) is decorated with scenes from the San Gu Mao Lu. A further meiping vase is, however, particularly close in painting style to the current guan jar. A superb Yuan dynasty meiping was excavated in 1950 from a tomb in Jiangning county, Jiangsu province, belonging to Mu Ying, a favourite of the Hungwu emperor, dated to AD 1392 (Fig. 6). This vase, which is now preserved in the Nanjing Museum, is decorated with scenes depicting Xiao He pursuing Han Xin by moonlight. This story is set at the beginning of the Han dynasty when Liu Bang was in Sichuan province and Xiao He was his Chief Minister. Xiao He recommended his friend Han Xin to his master, but when, after waiting for some time, Han Xin had received no appointment he departed during the night. Xiao He rode after him in order to persuade him to come back, and convinced Liu Bang to appoint Han Xin commander of his armies. The Nanjing meiping shares with the current jar a very similarly painted petal band containing emblems. This is around the foot of the jar and around the shoulder of the meiping. There are several other aspects of the decoration on this meiping that suggest not only that it may have come from the same workshop as the current jar, but that its main decorative band may even have been painted by the same artist. Comparison of the figures of Su Dai (on the jar) and Xiao He (on the vase), as well as comparison of their steeds, bears this out. Identical painting of tree bark and foliage, bamboo and plantain all suggest the same hand. It may also be significant that both the jar and the vase have balancing, off-set, brackets above the petal bands around their feet: a feature shared by the jar formerly owned by Baron It?, and by the meiping in the Victoria and Albert Museum, which also displays specific painting style similarities. There are several Yuan dynasty pear-shaped vases which share narrative themes and aspects of painting style with the jars and vases. The example closest in painting style and quality to the jars was excavated in 1956 from a tomb at Changde in Hunan province and is now in the Hunan Provincial Museum (illustrated in Zhongguo wenwu jinghua daquan - taoci juan, Taipei, 1993, p. 327, no. 533). On this vase a soldier with a banner is depicted standing behind his seated commander. The banner is inscribed with the four characters Meng tian jiang jun, indicating that the commander is General Mengtian, who served at the court of Qinshihuangdi, the first emperor of the Qin dynasty. The majority of the other pear-shaped vases with narrative scenes are not, however, decorated with quite the same painterly skill as the jars, although a pear-shaped vase formerly owned by Mr. Junkichi Mayuyama, and decorated with scenes from San Gu Kong Ming (illustrated by Kikutaro Saito in Kobijutsu 1967, no. 18, plate 10), appears to show the only other example of a rustic bridge over a waterfall. This is, however, rather more crudely painted than the example on the current jar. The painting on the current jar and the Nanjing meiping are the most similar, and demonstrate the highest level of artistic achievement within a group of vessels that already represent the finest Yuan dynasty painting on porcelain. The current jar was acquired in China during the first quarter of the 20th century by Captain Baron Haro van Hemert tot Dingshof (1879-1972), who on retirement rose to the rank of Major General. The Captain was in the Dutch Marine Corps stationed in Beijing from 1913 to 1923. He was Commander of the Netherlands Legation Guards Detachment, responsible for the security not only of the Dutch, but also of the German and Austro-Hungarian legations and enclaves. Captain Baron van Hemert had a great love of art and was a keen collector. As can be seen from surviving pictures taken in his Beijing home (Fig. 7) he had a particular admiration for Chinese porcelain. Ironically, at the time when he acquired this jar Yuan porcelain had not yet been recognised as including such fine wares, and he bought it as dating to the Ming dynasty. Despite the information provided by the David vases, discussed above, it was not until 1968 that the Cleveland Museum of Art held its ground-breaking exhibition Chinese Art Under the Mongols: The Yuan Dynasty (1279-1368), and connoisseurs in the West started more generally to revise their views of early blue and white porcelains and recognise magnificent pieces, like the current jar, as treasures of the Yuan dynasty.